Meet the developmental needs of young children who are hearing, Deaf, hard-of-hearing, apraxic, or have other communication disorders, from age two and a half to five years old. 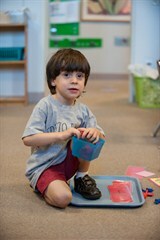 Opportunities to create, explore, learn problem solving, and experience personal interaction skills. Our program is licensed by the Ohio Department of Education and is a Five-Star Step Up To Quality rated program. Step Up To Quality is Ohio's raiting system for learning and development programs. Our Five-Star rating shows that we are committed to providing early childhood opportunities that meet a variety of high quality standards set by the state. In order to meet the individual needs of our students, our program has a significantly lower student to teacher ratio than most programs. This allows the teaching staff to provide more individualized instruction and support to students throughout the school day.